It's normal to become anxious before a major event. A job interview, a health appointment, or even a first date can all be nerve-wracking and cause a build up of stress prior to the occasion. However, frequent anxiety episodes or consistent and long-term worry (i.e., for six months or more) is not healthy, and when this - and its accompanying symptoms, like difficulty concentrating - impede upon your personal and professional well-being, this could be suggestive of an anxiety disorder. Anxiety disorders affect around 40 million American adults - that's 18% - every year. What Constitutes an Anxiety Disorder? Unlike normal human worrying, anxiety disorders are characterized by fear and uncertainty that frequently recurs for at least six months, often occurring alongside other mental or physical illnesses, such as depression, alcohol abuse, or fatigue. Generalized anxiety disorder (GAD) is the most common type of anxiety illness, affecting 18% of Americans every year - approximately two-thirds of whom are women. GAD is defined by exaggerated and excessive worry and tension on a daily basis with very little provocation. GAD patients tend to be consistently anxious about money, family, and health issues, which can cause difficulty concentrating, irritability, sleep disorders, and an inability to relax. While GAD is the most common form of anxiety, it is by no means the only form. A panic disorder is defined by the regular occurrence of all-consuming panic attacks. These attacks can happen suddenly, when feelings of terror and loss of control cause debilitating chest pain, difficulty breathing, sweating, dizziness, and nausea. Post-traumatic stress disorder (PTSD) is another anxiety disorder where the sufferer is unable to escape harrowing flashbacks that make them feel as though they are re-living a traumatic event they've experienced. 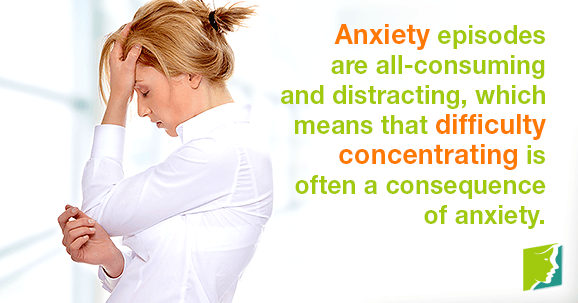 Other examples of anxiety disorders include obsessive-compulsive disorder (OCD) and phobias. Consistent or recurring anxiety episodes are thought-consuming and distracting, which means that difficulty concentrating is often a consequence of anxiety. Tiredness, restlessness, and other side effects of consistent worry can also make concentrating difficult. When you are trying to absorb information while reading or listening, anxiety can make it difficult to take interest in, process information, or pay attention during a task. Needless to say, this can threaten both professional performance and personal relationships. Combating the symptoms of anxiety disorders, such as difficulty concentrating, can be achieved with a change in the way tasks are approached, and developing habits that maximize concentration levels and minimize stress. Treating anxiety disorders is usually a process that combines medication and psychotherapy, though medication is dependent on the specific disorder and preferences of the patient. Cognitive behavioral therapy (CBT) is a practice that aims to change the thinking patterns that trigger fears and adapt the way the patient responds to these fears in a provocative situation. While treating anxiety disorders is usually a long-term and ongoing process, support groups, internet blogs and chat rooms, and the support of loved ones can help counter the emotional effects of anxiety episodes. Many people do not realize that anxiety disorders are legitimate illnesses because the outward symptoms are not always recognizable. This makes it easy for others to dismiss the severity of anxiety episodes with well-meaning, but unhelpful "Don't worry!" and "Calm down" advice. This can make suffering with anxiety issues a lonely experience and may increase the likelihood of further problems, such as depression. If you identify with difficulty concentrating or any of the other listed symptoms associated with anxiety, it's important to reach out, as there are treatment options available. There are many factors that can weigh into your ability to concentrate, such as not being in the moment and worrying a lot. Find out more here.